A drug dealer who chased and fatally stabbed a man as he shouted "you've got the wrong guy" has been found guilty of murder. Daniel Fitzjohn, 34, died in hospital after the attack in the Kingsley area of Northampton on 14 June. 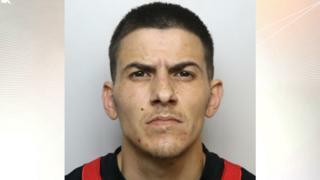 Daniel Quinn, 28, from Wolverhampton, was unanimously convicted by a jury at Northampton Crown Court on Tuesday. Parminder Sanghera, 25, also from Wolverhampton, was found guilty of manslaughter. At about 21:25 BST, Mr Fitzjohn was in a taxi outside Fairfield News in Kingsley while three friends were inside. CCTV from inside the shop showed Quinn arguing with one of Mr Fitzjohn's friends, who Quinn regularly sold drugs to. A fight between the two spilled out of the shop and was interrupted when Mr Fitzjohn "stepped in" by punching Quinn. Quinn returned to his grey Mini, mounted the kerb and drove at Mr Fitzjohn and his friends before driving off. While the taxi took Mr Fitzjohn and his friends to nearby Brookfield Road, Quinn picked up Sanghera from a house on Romany Road and the pair set out to "track down the people in the taxi", prosecutors said. When they located them on Brookfield Road at about 21:45 BST, they got out and chased them armed with a knife and machete. Mr Fitzjohn became separated from his friends and the chase resulted in Quinn - who was holding the knife - inflicting two stab wounds despite eyewitnesses reporting the victim pleading to Quinn that "you don't know me, you've got the wrong guy". The attack and events preceding it were captured almost entirely on CCTV and the dashcam of the taxi Mr Fitzjohn had been travelling in. Quinn and Sanghera will be sentenced at Northampton Crown Court on Thursday.